With Children’s Book Week fast approaching in Australia, there’s still time to buy or borrow this wonderful short-listed children’s picture book! 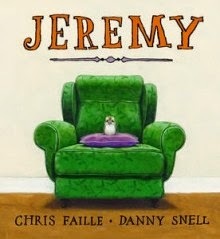 Jeremy was written by Chris Faille, illustrated by Danny Snell, and published by Working Title Press (2013). There are Teacher Notes to accompany it. When tiny Jeremy falls out of his nest and is brought home by the family cat, he is only a few days old. Luckily, Jeremy is a fighter. As the weeks go by he grows stronger and stronger, until the time comes to say goodbye. I get excited when I find excellent non-fiction pitched at younger children. Partly because excellent non-fiction for kids is not as common as excellent fiction. But also because it’s so important to ensure our children have access to all sorts of reading material, so they can choose what they WANT to read. I know lots of youngsters who will be keen to share this story once they know it’s actually based on a true account. Still more kids will just adore the idea of a feel-good story about a very cute baby kookaburra. Faille has done a masterful job of telling a tale children will understand and enjoy. His “voice” is a child’s voice, and he focuses on telling us things kids will want to know: what the baby kookaburra looked like, how they looked after it, how it grew and changed and expressed itself. Snell’s illustrations were done in acrylic paints on MDF board, enabling him to capture lots of detail and some wonderful kookaburra character! There’s an understated but excellent positive message at the end of the book when Jeremy is released to the wild and goes off with other kookaburras to live as nature intended. I also loved the end papers and their extra facts about kookaburras. Jeremy makes a superb model of a non-fiction text. Children can study its features and use them in their own writing. I heartily recommend it as an acquisition for libraries looking to expand their non-fiction resources for under 7s, or for those who want a great book about a favourite Australian bird. Jeremy has been short-listed for The Eve Pownall Award for Information Books. It also receives the coveted Book Chook Feather of Approval! Most children will know the song Kookaburra Sits on the Old Gum Tree. Can they sing it as a round? Have kids try to innovate on the lyrics to suit Jeremy e.g. Join your friends and be free. Can they invent actions to suit their new song? Baby kookaburras are commonly called “chicks”, just like most baby birds. Do children know any special names for native Australian animals? You can see some baby native Australian animals here. Some people call a baby platypus a puggle, and koala and kangaroo babies are known as joeys. If we were going to invent a name for a baby kookaburra, what could it be? A kookabubba? A kookaling? Ask someone who has cared for a lost or injured native animal to come and share that experience with the children. WIRES may have a guest speaker you can use. 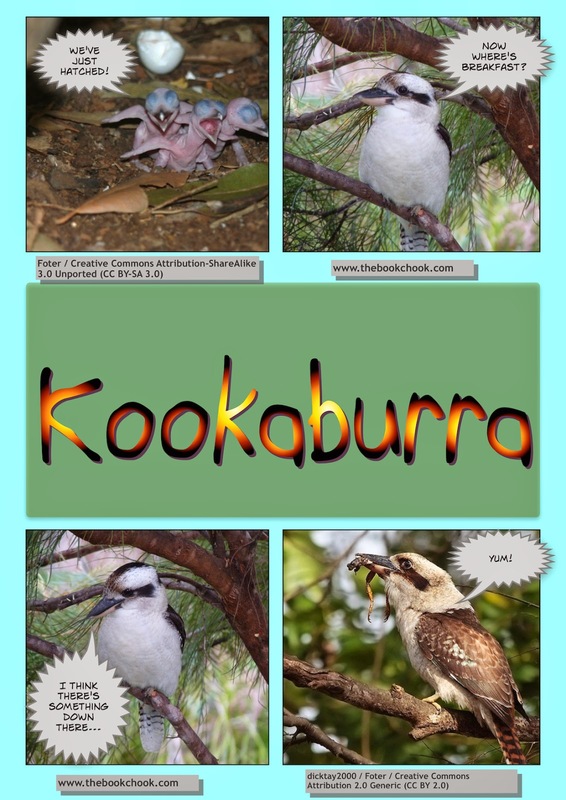 Wildlife Rescue Magazine has a lot of information about Kookaburras in Care. Go on a nature walk with camera or iPads and try to find a kookaburra to photograph. Consider using the snaps to illustrate an information report that you collaboratively create as a class. You could add photos to a Comic Life template the way I did above, and use speech bubbles to share facts, or tell a story. If you'd like the free PDF of the image above, perhaps as a model for kids to use, visit my Fun with Learning blog. Illustrator Myke Mollard shares some great how-to-draw tips for Australian bush creatures, including kookaburra. Activity Village has a very simple learn to draw kookaburra, as well as a kookaburra tracing page for younger kids. Watch this short video clip of Don Spencer with an injured kookaburra at ABC Splash. Go bush! Have a kookaburra laughing contest. Make damper “snakes”, twist them around green sticks or soaked skewers, and cook them. Build kookaburra nests near gum tree trunks.